Walking from my room to the theatre was crazy. There were people everywhere, and they were all there for us. Once I was in the room, it was also crowded with people just for us. Today, the triplets and I were the superstars. There were comments about the dramatic weight loss program I was about to undergo. Then I Had to sit on the bed and bend over as the epidural was given. “Bending over” with three babies in my belly was hardly bending over, more like “leaning slightly forward”. Thank goodness it was obvious it was working working as my legs started to go numb. The anaesthetist was talking to me and making sure I couldn’t feel anything. Alex came in and gave me a nervous smile, but he also looked excited. I was just scared by now. When they started cutting it was such an odd feeling. The whole pulling and tugging and fiddling was all a bit surreal. The doctor and his attending surgeon were concentrating hard. The nurses and all surrounding were watching with great interest. As the doctors were fiddling around doing doctor things, I began to feel really sleepy. I told the anaesthetist who wasn’t phased and said it was only natural, there was a lot going on. I can remember thinking how entirely ridiculous it was that people were cutting me open and reaching into my insides, my three children were about to be born, and I just wanted to roll over and have a snooze. Before long everyone was leaning forward in interest and the anaesthetist, who had our camera, was poised, ready to shoot the action. I felt it as they tugged Triplet 1 free. He had been head down and was very ready to be born. I was disappointed because I had expected to see the baby immediately after he was born. However, straight away the doctor handed the baby straight to the nurse who quickly took him straight from the room. I can remember watching that nurse disappear, trying my best to see what my baby looked like. All I could see was the top of his tiny head. As soon as he was out of sight, I started concentrating on what was happening with the next baby because a lot of tugging and pulling was going on there again. When T2, my breach baby, was born, the doctor held him up ever so briefly, (as in mere seconds). Even still, it was so wonderful to see him. He was then rushed away by a nurse and once again I tried to watch him for as long as possible. The next bit was the most uncomfortable of the whole proceedings. The epidural only had effect up to around my belly button. Unfortunately T3 had firmly wedged herself under my ribs. She was lying transverse across the width of the top of my stomach. I said that I could feel it, and instantly I was given more drugs to alleviate it. I could still feel it, so a bit more solved the situation. It was then very uncomfortable as they tugged and pulled and pushed quite strenuously. It felt like forever – well at least 10 minutes anyway. 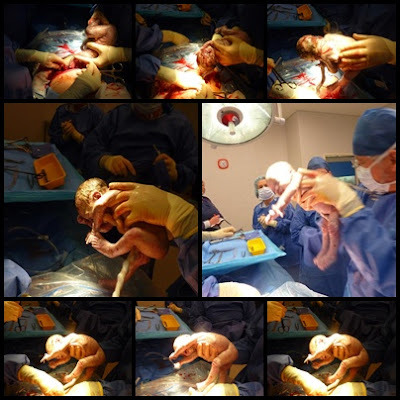 In reality there was 3 minutes in between the first baby being born and the last. The boys were both born at 1:23pm and the little lady at 1:25pm. Later I questioned the nurses about the accuracy of the time. “I’m sure there was several minutes between the boys,” I explained, “And it was a very long time with Missy, at least 10 maybe 15 minutes is what it felt like. Are you sure the times are right?” The nurses assured me that these times would be correct. They said that everyone is automatically programmed to look at the clock immediately when the baby is born. Sure enough, when looking back at pictures of their births, I can see the nurse turning around, checking the clock. The time is the exact time recorded on their birth certificate. ing, “Here she is. Hello Mummy. Hello Mummy.” As he was holding her up, he had her little hand and was waving it at me. I can’t remember why but I didn’t think it was funny. But I did like seeing my little girl. Triplet Three enters the world. Once the babies were born, Alex went over to where they were weighing and checking them. He said hello to all the babies and told the nurses their names. We had already decided upon the names for the babies according to where they were situated in my womb. I was on my own as they finished whatever they were doing on my stomach. The doctor commented that my stomach muscles and had been completely separated from being stretched and that I would need physio to repair it. I was still really sleepy, so as they were busy at work and since Alex wasn’t around I succumbed and had a bit of a doze. Last year, while I was in hospital after having the triplets, I continued writing my pregnancy journal. I left Week 34 as a cliffhanger. I fully expected to finish the story in the following weeks. How wrong I was. I had expected to write the story while the babies were in the special care nursery, but they were so healthy they got out so much sooner than expected. So here is the beginning of the tale, better late than never. I slept on and off until Dr. Mac visited me around 7:00 am. He basically said that I was very close to delivering, but we didn’t know whether it was a matter of hours or a matter of days. His advice was to monitor the dilation of the cervix, and to act immediately if it started to advance beyond 3cm. He then noted that he was going to take the rest of the day (Friday) off, and that he also was not rostered on over the weekend, so he would hand me over to the care of Dr. K. I was starting to feel like this was patient pass the parcel. Dr. K came to visit me about an hour later. He didn’t seem to be as confident as Dr. Mac that the labour would last days, but he was still leaving the decision up to us as to whether we would choose to have a Caesar straight away, or take our chances waiting. About another hour later, after a shift change, a new midwife came to check on me. She sat on the side of my bed with her hands placed gently on my stomach, just feeling. She was surprised by the amount and frequency of the contractions. Her advice was to have the babies during the day, since the weekend was about to begin and it would be more difficult to muster up an operating team required for an emergency Caesar for triplets. We agreed. I had delivered T-Star in around 2 hours from the start of the first contraction. And with J Boy, once my waters broke, I delivered him also in under two hours. So it was safe to say that Alex and I were already nervous that once this labour progressed into anything serious, we may not have time to assemble a team before babies started dropping out, (in the case of Triplet 1, who was head down and right at the exit ready to go) and the others getting stuck and distressed (Triplet 2 was breach and Triplet 3 transverse). Another phone call and we all agreed to schedule a Caesar for that day. 1:00 was booked and a crew was quickly assembled. Everyone seemed to be on standby as it was. They had been expecting me for quite some time in the maternity ward. Nobody had expected that I would avoid hospital for as long as I did. When I appeared on Thursday night, everyone was on high alert. There wasn’t too much more to do than wait. The time went very quickly. We took some last pregnancy snaps, got dressed in my very becoming hospital attire and become extremely nervous. 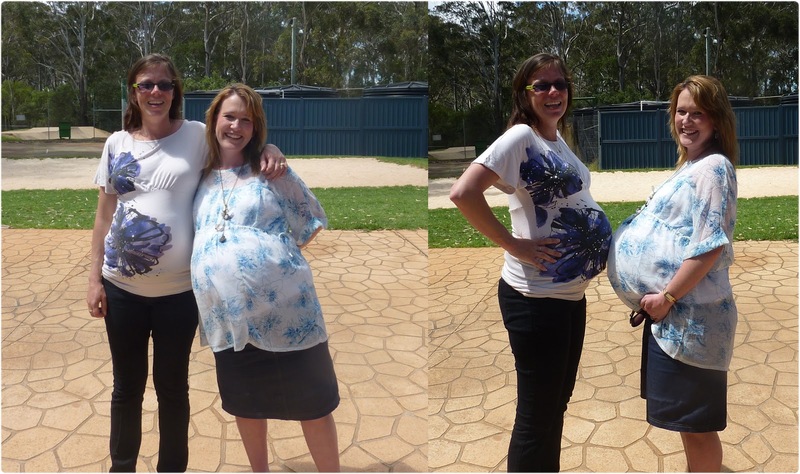 About an hour before the triplets were born. I have to say, this dress is very flattering. It doesn’t seem to reflect how large my stomach really was. To gain perspective, look at how I’m positioned in the doorway. Admittedly though, I didn’t get as large as I thought I may. 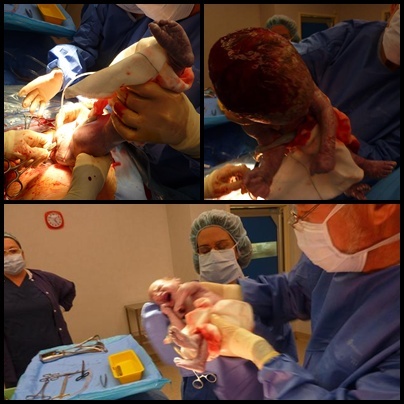 Pregnant triplet ladies – take heart, it may not be as bad as you think. rationality and damage all four of us trying to bypass the surgical option! Finally after incubating three little people for 239 days it was time for them to make their appearance in this world. Their life had started at conception 34 weeks and 1 day ago, now it was time for them to leave the mother ship and begin living their own existence. Week 30 began with me being stressed out, which resulted in experiencing my first contractions in the morning while trying to get ready. We had the In Home Care Co-ordinator coming for an inspection. The In Home Care was officially scheduled to begin next day, so I was stressed that we get everything right so it could all start smoothly. The weekend before the boys left for Cairns, I got The Accountant to start drilling locks into doors etc. It was a lot of fiddling around and he got some done, but not all. Plus we discovered we needed to buy some more for various areas. It’s a bit hard buying the locks because you don’t know which ones will work, and which ones won’t. So, once he had returned I was giving reminders to get it done, but then this thing and that popped up and before we know it we’re rushing around frantically late the night before, and the morning of, trying to get all the last minute things done. The biggest problem was that locks weren’t sticking on and were falling off all over the place. I was also changing things in cupboards so I wouldn’t need to put locks on and ruin the paintwork (My office cupboard now holds a startling array of kitchen, first aid and other various ‘dangerous’ items now. It’s all a bit bizarre.) I was printing out emergency contact lists to put near the phone, trying to find places to hang keys near doors, have paperwork sorted, and run through the house checking that there were no scissors, plastic bags, etc lying around. I knew the co-ordinator is a really lovely lady, and good to work with, I just wanted to get everything right. As it turned out we had done everything we needed, the locks managed to stay in place long enough and conveniently fell off after she left. (I think we’ve replaced them all now…) The co-ordinator was surprised that I’d filled all the sheets in and read all the documentation! Apparently most people don’t! Hooray to me for being a star student! And I was able to sort out a whole heap of issues that the In Home Carer had raised so that some of the more ridiculous red tape and fine print could be as flexible as possible to work in with our household. Not that I am able to eliminate the red tape, of course. The classic issue this week was that I was told that regular visitors to the house (while the In Home Carer is working) would need Blue Cards – including my own mother! What a joke! Luckily we have talked to the governmental department and discovered that this is not a requirement at all for family members. Sometimes I wonder whether this is going to be worth the effort. I’m sure it will once the triplets arrive, but in the meantime, it’s stressing me out! After the inspection, I spent the rest of the day in bed, which helped settle down the contractions. One of the most unfortunate part of the whole dilemma was that I still was feeling very tight in the stomach that evening, so I had to miss my beloved book club! The rest of the week progressed fairly smoothly. The Accountant is being such a big help with the kids. I know it’s exhausting him having them all through the weekends without a break, but he really is such a wonderful Daddy, and the kids just love all the time he’s spending with them. He is also a champion coming home from work and getting stuck straight into final dinner preparations. Friends and family have been regularly supplying us with meals now, which makes things a lot easier,He’ll help with cleaning up and bathing the boys and putting them to bed. I try to help as much as possible, but I’m really not able to do too much anymore, I immediately start cramping. He’s such a devoted husband and father – I love him dearly and feel very much loved by all that he does for us. The week started by waving the three male members of our household goodbye as they began their journey to celebrate a family birthday in Cairns. Meanwhile back at home. I had a lovely four days on my own. I miss my boys when they are away, and I often wonder what they were doing and phoned in for regular checkups, but I’m not the type of mother/wife that pines away when left on my own. I quite like the “Me Time”. There were a few things that I wanted to get done around the house. Unfortunately those were not done. When I was at home, I mostly stayed in bed and did some serious snoozing as well as read a book. “The Help”- I know it’s all the buzz at the moment with the movie release, and there’s a reason why, it’s particularly brilliant. Can’t wait to see the movie, don’t know when I’ll get a chance though, since I’ll be having to wait until it’s out on DVD. Also had a nice social time with friends coming around to visit on Thursday, had lunch with another girlfriend on Friday, dinner with my Dad and sister Saturday night and lunch with the family on Sunday for Father’s Day. Possibly the reason why I lacked the motivation to do anything but stay in bed while I was at home. And for those who get concerned about over activity, all social events were within a fairly confined time frame, so I didn’t overdo it. It was lovely to welcome the boys’ home and hear all their stories. Toddler T was super clingy and wouldn’t do anything else but sit on my lap, or very close to me (when he was getting too heavy), for almost three hours. I just enjoyed the cuddles. I’m certainly getting used to the whole concept of having other people cooking and cleaning for me! It can still feel awkward, but I start feeling very tired and my stomach starts getting tight if I do too much, so it makes me back off. The place is looking so clean though. It could be a little tidier – but that’s no one’s fault but my own. Whenever I’m up, I’m constantly trying to remove my piles of junk. It’s a time consuming process at the best of times, but it’s ridiculously slow now. Hopefully I can tidy up the last of the hot spots before the triplets arrive. I’ve given up on tidying out the office and laundry cupboard, however. That will have to go on the agenda in about a year’s time! Another appointment with the doctor towards the end of the week. Heartbeats all present and accounted for! We have set the date for an elective Caesar. It will be at 37 weeks on October 28. It seems so far away! I know it’s best for the babies to keep them in as long as possible, it’s just that 7 more weeks seems like a long time to remain pregnant. I’m already over the size when most pregnant women are moaning (including myself the previous two times) that they just want the baby to be here and their old bodies back!!! It’s like being told you have to go two months overdue! Having said that, I should pause and be grateful, because my stomach has stopped growing as quickly as it had been. The babies are still growing at a good pace, so I’m glad that I’m not!